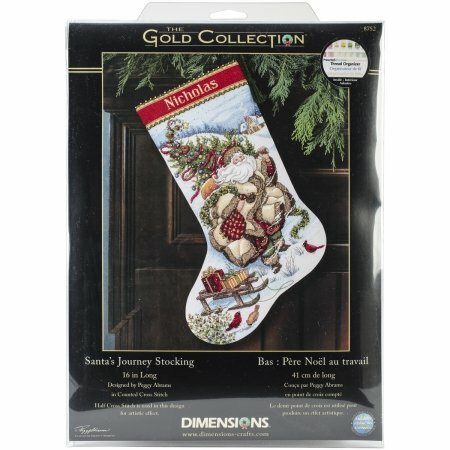 DIMENSIONS-Gold Collection-Santa's Journey Stocking. Counted Cross Stitch. Kit contains: wool yarn cotton thread metallic thread 18 count white Aida felt beads thread sorter needle and easy instructions with an alphabet. Finished size: approximately 16 Long. Ho Ho Ho! 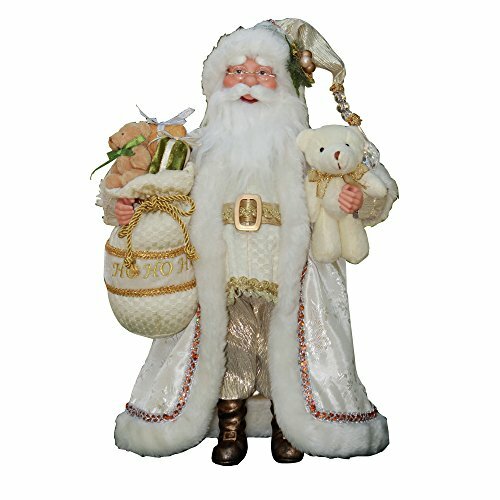 This classic white and gold Santa has a crisp, clean, and elegant white coat, bright trim, and a large crystal garland tapers from his matching white and gold trimmed hat. He's carrying an adorable white teddy bear in one hand, and his embroidered Ho Ho Ho toy bag is brimming with wrapped presents and another brown teddy bear in his other hand. His wonderfully soft beard and mustache add warmth and charm and match his rimless glasses and jovial expression. His solid polyresin (not plastic) boots enable him to stand firmly on any flat surface and his hat and coat have hidden wires to adjust to any configuration. Let this classic white and gold Santa bring elegance and cheer to your holiday season. DIMENSIONS-Counted Cross Stitch Kit. This offers a fun and colorful design that will look great in your house once you have completed it! This package contains presorted thread, metallic thread, 14 count natural aida, needle and easy instructions with an alphabet. Design size: 16 inches long. 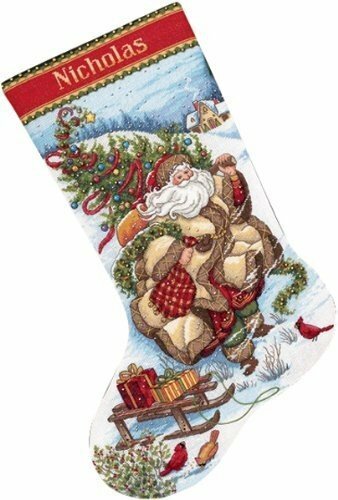 Design: Welcome Santa Stocking. Imported. DIMENSIONS-The Gold Collection: Counted Cross Stitch. The Gold Collection Kits are wonderfully detailed with full and half cross stitches. Kit includes: 16 count white Aida; cotton thread; thread sorter; needle and easy instructions. Mats and frames are not included unless otherwise stated. Finished size: 16in. 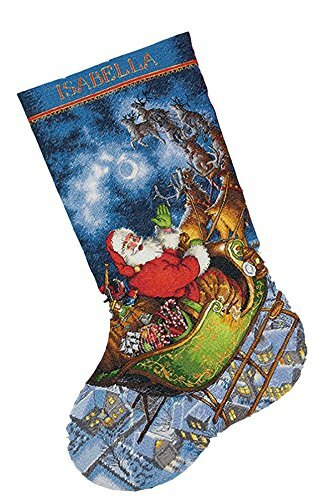 Design: Santa's Toys Stocking. Designer: Hazel Bardon. Made in USA. White Woodland Santa is ready for the outdoors. He is warm & toasty in his brown mittens, white cable knit sweater, fleece jacket, and furry boots. 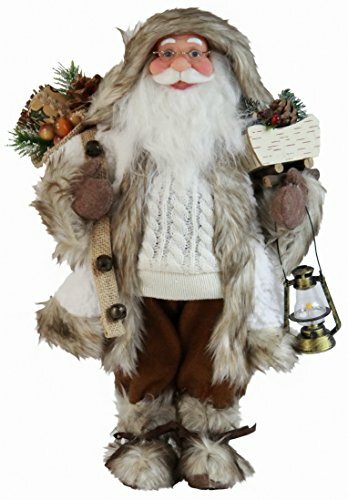 He is carrying a lantern to bring light and warmth into your holiday season, and has an adorable miniature birch sled with pinecone, berries, and evergreen floral. Plus he's carrying a loaded burlap toy bag with natural wrapped paper with holly pattern and twine ties, and even more evergreen floral. His solid furry boots with faux leather ties are sure to keep him dry and warm throughout the season and allow him to stand firmly on any flat surface. Bring the outdoors into your home this year with White Woodland Santa. 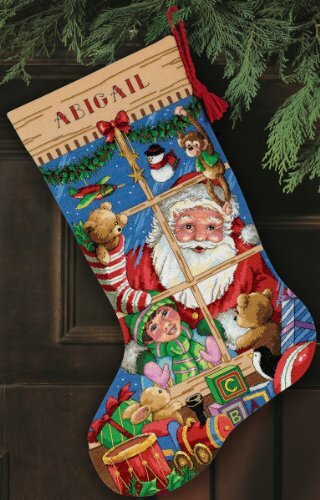 Santa's Flight Stocking portrays that jolly old elf soaring high o'er the rooftops. You're sure to enjoy stitching and gifting this marvelously detailed Gold Collection counted cross stitch design. Finished size is 16-Inches-by-10-Inches. 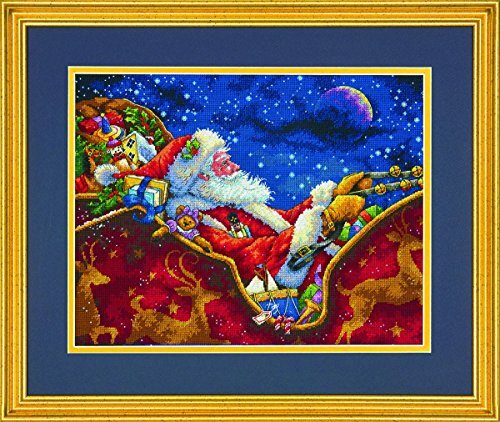 Santa's on his way to deliver toys to all the good girls and boys in this delightful Counted cross stitch scene. A brilliant palette of cotton and metallic thread is used to create Santa's midnight ride from the gold collection by dimensions. Designed by Donna race. Donna race. Counted cross stitch kit includes: pre-sorted cotton thread metallic thread 18 count navy Aida needle instructions. 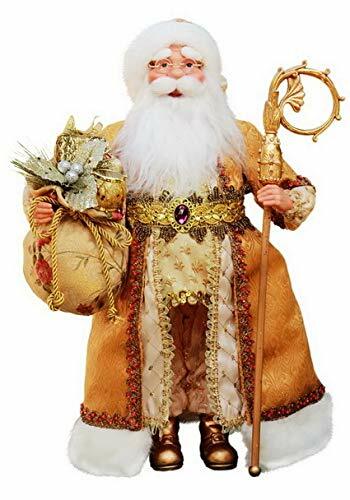 This opulent Santa is walking into your holiday season with a golden staff and floral printed gold fabric toy bag loaded with a gold drum, wrapped presents, and glitter florals. He has a wonderfully soft beard and mustache, and is adorned with a gold coat, beaded trim, white tassel, and violet medallion. His gold polyresin (not plastic) boots enable him to stand solidly on any flat surface and his hat has a hidden wire to adjust to any configuration. Let him bring warmth, joy, and opulence to your holiday season. Looking for more Gold Collection Santas similar ideas? Try to explore these searches: Laser Tag Games, Christmas Ornament Bead Kit, and Continental Address Plaque. Look at latest related video about Gold Collection Santas. Shopwizion.com is the smartest way for online shopping: compare prices of leading online shops for best deals around the web. 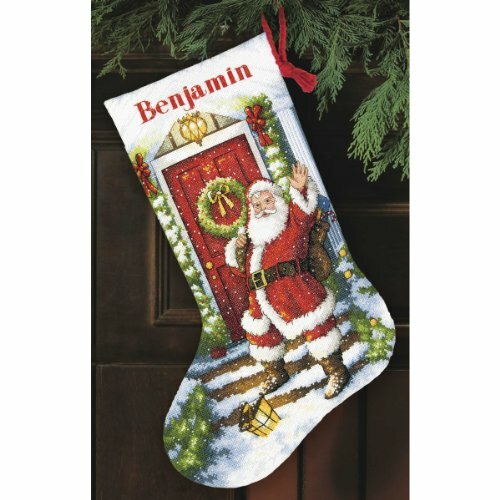 Don't miss TOP Gold Collection Santas deals, updated daily.